Chopsticks are a pair of small even-length tapered sticks used as the traditional eating utensils of China, Japan, Korea, Taiwan, Vietnam, and Thailand. Generally believed to have originated in ancient China, they can also be found in some areas of Tibet and Nepal that are close to Han Chinese populations. The pair of sticks is maneuvered in one hand, between the thumb and fingers, and used to pick up pieces of food. Chopsticks are typically about 25.4 cm (10 inches) long and .6 cm (¼ inch) thick at the top, gradually narrowing to a blunt or pointed tip at the base. Chopsticks are typically about 25.4 cm (10 inches) long and .6 cm (¼ inch) thick at the top, gradually narrowing to a blunt or pointed tip at the base. They are made from a variety of materials including bamboo, plastic, various types of wood, bone, gold, silver, stainless steel and other metals, horn, jade, coral and ivory. Long chopsticks made of wood or bamboo are used for cooking. The widespread use in Asian restaurants of disposable chopsticks made of wood or bamboo is contributing to deforestation in China. In China, where an estimated 45 billion pairs are used and thrown away annually, adding up to 1.7 million cubic meters of timber or 25 million fully grown trees every year, the government imposed a 5 percent tax on disposable chopsticks. Other initiatives to reduce the use of disposable wooden chopsticks include public education campaigns, programs in which restaurants collect used chopsticks for recycling instead of throwing them away, legislation to enforce the use of re-usable plastic or stainless steel chopsticks in institutions and public restaurants, and popular movements encouraging individuals to carry their own personal sets of chopsticks in purses and pockets to use in restaurants and offices instead of disposable chopsticks. Chopsticks originated in ancient China as early as the Shang dynasty (1750-1040 B.C.E.) and were widely used throughout East Asia. The earliest evidence of a pair of chopsticks made out of bronze was excavated from Yin Ruins's Tomb 1005 at Houjiazhuang, Anyang, Henan, dated roughly 1200 B.C.E. The earliest extant bronze chopsticks were excavated in sites dating from the fifth century B.C.E. (late Eastern Zhou to early Warring States periods). It is not clear whether these were used for eating utensils or as cooking utensils. There are references to chopsticks in the Qu Li section of the Book of Rites (Liji, c. late Zhou period). They are represented by a Chinese character that depicts a man holding two pieces of bamboo. Tools resembling chopsticks were also unearthed in the archaeological site Megiddo in Israel; this discovery may indicate the existence of a trade relationship between the Middle East and Asia in early antiquity or may be an independent parallel development. Chopsticks were also common household items of civilized Uyghurs on the Mongolian steppes during the sixth–eighth centuries. Chopsticks have long been the primary eating utensil in China, Japan, Korea and Vietnam. The limited use of chopsticks spread to other Asian countries in recent centuries with the arrival of Chinese immigrants in Southeast Asia, where food had traditionally been eaten with the hands. In countries such as Thailand, chopsticks are used almost exclusively to eat noodle dishes, while rice and other foods are generally eaten with a spoon or Western fork. In Japanese, chopsticks are called hashi, written 箸. They are also known as otemoto (おてもと, otemoto), a phrase commonly printed on the wrappers of disposable chopsticks. In Korean, 箸 (jeo) is used in the compound jeotgarak (젓가락) which is composed of jeo (chopsticks) and garak (stick). Jeo cannot be used alone. In Vietnamese, chopsticks are called "đũa," also from 箸. The English word "chopstick" seems to have been derived from "chop chop" which meant “quickly quickly” in Chinese Pidgin English. Only the smaller ends of chopsticks contact the food. 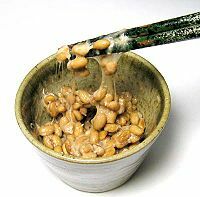 Here chopsticks are being used to eat a Japanese dish known as Natto, made from fermented soybeans. Many rules of etiquette govern the proper conduct of the use of chopsticks. Held between the thumb and fingers of one hand, chopsticks are used tong-like to pick up portions of food, which are prepared and brought to the table in small and convenient pieces. Chopsticks may also be used (except in Korea) as means for sweeping rice and other nominal morsels into the mouth directly from the bowl. Chopsticks are traditionally held in the right hand only, even by left-handed people. Although chopsticks may now be found in either hand, a few still consider left-handed chopstick use as improper etiquette. Some historians believe this rule of etiquette originated from a Chinese legend. In chopstick-using cultures, foods that cannot be easily separated with chopsticks are generally cut into small, bite-sized pieces during preparation. Some chopstick designs have carved rings encircling the tips to aid in grasping larger pieces of food. Rice, which would be nearly impossible to eat with chopsticks if prepared using Western methods, is usually prepared in East Asia with less water, leading to "clumping" of the rice conducive to eating with chopsticks. The primary cultivar of rice used in East Asian countries is japonica, which clumps together more easily than indica, the rice used in most Western and South Asian countries. The short-grained “sticky” varieties of rice (Oryza sativa var. japonica) in Japan and Korea are easily lifted from the table to the mouth with chopsticks, while Chinese varieties require the rice bowl to be brought close to the mouth when using chopsticks, which are used with a raking motion. Chopsticks are typically about 25.4 cm (10 inches) long and .6 cm (¼ inch) thick at the top, gradually narrowing to a blunt or pointed tip at the base. Blunt tapered chopsticks provide more surface area for holding food and for pushing rice into the mouth. Pointed tapered chopsticks allow for easier manipulation of food and for picking out bones from whole cooked fish. Very long chopsticks, usually about 30 or 40 cm (11.8 to 15.7 inches), called saibashi (菜箸) in Japan, are used for cooking, especially for deep frying foods, or for serving. Shorter chopsticks are generally used as eating utensils but are also used for cooking. Chopsticks are made from a variety of materials including bamboo, plastic, wood, bone, gold, silver, stainless steel and other metals, horn, jade, coral and ivory. Wood and bamboo chopsticks are used for cooking because they are inexpensive, withstand high temperatures, and do not alter the taste of food. The matter surfaces of bamboo and wood chopsticks provide a good grip for holding food, but they can warp and deteriorate with continued use. Natural wood chopsticks, like natural wood food preparation surfaces, have an innate antibacterial property absent in other materials. Lacquering or applying oil or paint to the wood surface reduces the antibacterial effectiveness. Almost all disposable chopsticks are made of either bamboo or wood. Disposable unlacquered chopsticks are used especially in restaurants. These often come as a piece of wood which is partially cut and must be broken into two chopsticks by the user (demonstrating that they have not been previously used). In Japanese, these are known as waribashi (割り箸). Plastic chopsticks are cheap, do not conduct heat, and are resistant to wear. Plastic chopsticks are not as effective as wood and bamboo chopsticks for picking up food, and cannot be used for cooking since high temperatures may melt the chopsticks and produce toxic compounds. Modern plastic chopsticks for children are often decorated with popular cartoon characters. Metal and stainless steel chopsticks are durable and are easy to clean and sanitize. Like plastic chopsticks, metal chopsticks are more slippery than wood or bone chopsticks. They also tend to be more expensive. They conduct heat easily and are not as comfortable to use as cooking utensils. Metal chopsticks are sometimes roughened or scribed on the tapered end to make them less slippery when picking up foods. Materials such as ivory, jade, coral, gold, and silver are typically used to make expensive and valuable chopsticks for special occasions. Wooden or bamboo chopsticks can be painted or lacquered to decorate them and make them waterproof, and inlaid with ivory and gold. Silver and gold chopstick pairs are sometimes connected by a short chain at the untapered end to prevent their separation. Chinese: longer sticks that are square in cross section at one end (where they are held) and round in cross section at the other (where they contact the food), ending in a blunt tip. Japanese: short to medium length sticks that taper to a pointed end. This may be attributed to the fact that the Japanese diet includes large amounts of whole bony fish. Japanese chopsticks are traditionally made of wood and are lacquered. Some chopstick sets include two lengths of chopsticks: shorter ones for women and longer ones for men. Child-sized chopsticks are widely sold. Korean: medium-length stainless-steel tapered rods, with a flat rectangular cross section. (Traditionally, they were made of brass or silver.) Many Korean metal chopsticks are ornately decorated at the grip. They are sometimes used to pick up food onto a spoon, which then brings food to the mouth. Vietnamese: long sticks that taper to a blunt point; traditionally wooden, but now made of plastic as well. A đũa cả is a large pair of flat chopsticks that is used to serve rice from a pot. Put one chopstick between the palm and the base of the thumb, using the ring finger (fourth finger) to support the lower part of the stick. The stick should remain stationary and very stable. Use the tips of the thumb, index finger and middle finger (third finger) to hold the other stick like a pen. Make sure the tips of the two sticks line up. With enough practice, the two sticks function like a pair of pincers, and can be used to cut and separate larger chunks of food. Tip: Chopsticks generally should be held at the thicker end about a third along their length for balance and efficiency. For greater reach to pick up food further away on the table, hold the chopsticks at the upper ends. 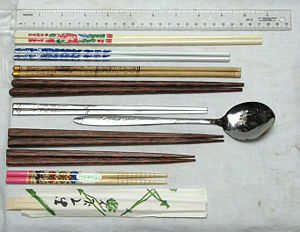 Chopsticks are used in many parts of Asia. While principles of chopstick etiquette are similar, the finer points may differ from region to region, and there is no single standard for the use of chopsticks. Generally, chopsticks etiquette is similar to general Western etiquette regarding eating utensils. Chopsticks are not used to make noise, to draw attention, or to gesticulate. Playing with chopsticks is considered bad mannered and vulgar. Chopsticks are not used to move bowls or plates or drag them towards you. Chopsticks are not used to toy with one's food or with dishes in common. Chopsticks are not used to spear or pierce food, except in rare instances. Exceptions include tearing apart larger items such as vegetables and kimchi. In informal use, small, difficult-to-pick-up items such as cherry tomatoes or fishballs may be stabbed, but this use is frowned upon by traditionalists. Chopsticks can be rested horizontally across your plate or bowl (except in Korea where they should be rested vertically across the plate) to keep them off the table entirely. A chopstick rest can be used to keep the points off the table. Chopsticks should not be left standing vertically in a bowl of rice or other food. Any stick-like object pointed upward resembles the incense sticks that some Asians use as offerings to deceased family members; certain funerary rites designate offerings of food to the dead using standing chopsticks. When food is served at a banquet, it is common for the host to pick up his chopsticks and say, “ji guai” (“begin using the chopsticks”). In Chinese culture, it is normal to hold the rice bowl up to your mouth with the left hand and use chopsticks with the right hand to push rice directly into the mouth. If rice is served on a plate, as is more common in the West, it is acceptable and more practical to eat it with a fork, spoon or spork. The blunt end of the chopsticks is sometimes used to transfer food from a common dish to a diner's plate or bowl. It is acceptable to transfer food from a common dish to the plates of closely related people (such as grandparents, parents, spouse, children, or significant others) if they are having difficulty picking up the food. Also it is a sign of respect to pass food to the elderly first before the dinner starts. It is impolite to spear food with a chopstick and/or play with the chopsticks. Finding a pair of chopsticks of unequal lengths at your place at the table is said to be a sign that you are going to miss your bus, train or ship. Dropping a pair of chopsticks is believed to bring bad luck. When a diner has finished eating, he or she places the chopsticks across the bowl with the tips pointing away. At Chinese weddings it is customary for the groom’s family to give fine chopsticks as a gift to ensure that the couple will remain together for a long time and have many children. Food should not be transferred from one's own chopsticks to someone else's chopsticks. Japanese people will always offer their plate to transfer food, or pass a person's plate along if the distance is great. Transferring food directly from one person’s chopsticks to another’s is reminiscent of Japanese funeral rites in which pieces of cremated bone are passed from one person to another. The pointed ends of the chopsticks should be placed on a chopstick rest when the chopsticks are not being used. When a chopstick rest is not available, such as in restaurants using waribashi (disposable chopsticks), a person may make a chopstick rest by folding the paper case that contained the chopsticks. In family-style eating, chopsticks are sometimes reversed to use the opposite clean end for picking up food from a communal plate, although it is not considered to be proper manners. It is more appropriate to ask for extra chopsticks to transfer food from a communal plate. Chopsticks should not be crossed on a table or vertically stuck in the rice, as this symbolizes death. It is rude to rub wooden chopsticks together after breaking them apart, as this communicates to the host that the user thinks the chopsticks are cheap. Koreans consider it uncultured to pick up a rice bowl from the table to eat from it. Dishes are to be left on the table. Unlike the rice eaten in many parts of China, cooked Korean rice can be easily picked up with chopsticks, although eating rice with a spoon is more acceptable. When laying chopsticks down on the table next to a spoon, you must never put the chopsticks to the left of the spoon. Chopsticks are only laid to the left for deceased family members. The blunt handle ends of chopsticks are not used to transfer food from common dishes. When no communal chopsticks are available, it is perfectly acceptable to pick up banchan (the multitude of pickles, condiments and relishes served on small plates with a traditional Korean meal) and eat without putting it down on your bowl first. There is an old saying suggesting that "the closer one's hand is to the tips of the chopsticks, the longer they stay unmarried." As with Chinese etiquette, the rice bowl is raised to the mouth and the rice is pushed into the mouth using the chopsticks. Unlike with Chinese dishes, it is also practical to use chopsticks to pick up rice from plates, such as fried rice, because Vietnamese rice is typically sticky. It is proper to always use two chopsticks at once, even when using them for stirring. You should not pick up food from the table and place it directly in the mouth. Food must be placed in your own bowl first. Chopsticks should not be placed in the mouth while chewing food. Chopsticks should never be placed in a "V" shape when you are finished eating; it is interpreted as a bad omen. Explosive growth in the use of disposable chopsticks in restaurants and even in homes, compounded by expanding populations of migrant workers in Asian cities who rely daily on restaurant meals served with disposable chopsticks, has made a serious impact on the environment. In China alone, an estimated 45 billion pairs of disposable chopsticks are used and thrown away annually, adding up to 1.7 million cubic meters of timber or 25 million fully grown trees every year. A study by a Japanese environmentalist organization found that 90 percent of the wood used for disposable chopsticks used in Japan is imported from Mainland China, and that entire mountains in Northern China are being logged to provide wood for chopsticks. Instead of replanting trees, Chinese peasants have been using the cleared land for agriculture, leading to rapid deforestation and erosion. ↑ Chinese Chopsticks Retrieved January 4, 2009. ↑ Maocun Lu, "An Introduction to Chopsticks," in Agricultural Archaeology 2004 (1):209-216. ISSN 1006-2335. ↑ UglyChinese.org The Huns – Part I Retrieved January 4, 2009. ↑ Jerry Norman, Chinese (Cambridge University Press, 1988), 76. ↑ Definition of chopstick Merriam-Webster. Retrieved January 4, 2009. ↑ Dean O. Cliver, Study on Antibacterial Properties of Wood Retrieved January 4, 2009. ↑ Saki Tanaka, Japanese Chopsticks (Ohashi) Etiquette Retrieved January 4, 2009. ↑ Chopsticks (Japanese language) Retrieved January 4, 2009. ↑ China imposes chopsticks tax ABC News (March 22, 2006) Retrieved January 4, 2009. ↑ Jacob Gordon, Bring Your Own Chopsticks Movement Gains Traction in Asia treehugger.com (January 30, 2006). Retrieved January 4, 2009. ↑ MyHashi Club Mother-earth.jp. Retrieved January 4, 2009. ↑ D. Hunter, et al. Chopstick arthropathy: the Beijing osteoarthritis study. Arthritis & Rheumatism 2004 50:1495-1500 (July 2004) Retrieved January 4, 2009. ↑ Whiter chopsticks raise health risk Xinhuanet News (June 2, 2005.) Retrieved January 4, 2009. Lu, Maocun. "An Introduction to Chopsticks," in Agricultural Archaeology, 2004, No. 1:209-216. ISSN 1006-2335. Norman, Jerry. Chinese. Cambridge University Press, 1988. Vance, Susan, and Mary Washburn. Chopsticks. Taipei, Taiwan (Formosa): Wu Hsueh Press. 1954. Bring Your Own Chopsticks Movement Gains Traction in Asia By Jacob Gordon, January 30, 2006. - The link between chopsticks and deforestation. This page was last modified on 16 February 2017, at 23:09.